Special Consideration and Out of District are now available online. Click for more info! Help support Ellison High School and EHS Athletics! 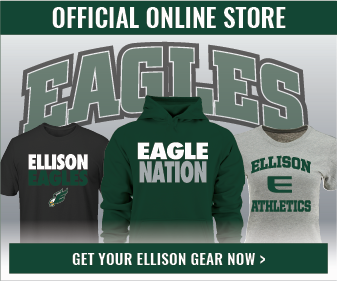 We now have an online store available with a wide range of Ellison-branded clothing. Click for more info! Click the title for dates and information on commencement ceremonies for schools across the area. The Eagle's Eye is an online publication run by the students at Ellison. Founded during the 2018-2019 school year, the site continues to grow and show the writing talent of the student body. Click the article title above to find out how you can read and follow their blog! Next year there will be a powerlifting class for those that want to participate in the sport . If you wish to sign up for the class, please see Coach Miller so that your name can be added to the list. Limited space available so sign up ASAP. Seniors, please let Mrs. Pierce, in the counselors’ office, know if you are awarded any scholarships, or have signed with a college or university. We would like to recognize your accomplishments in the graduation program. Do you want a yearbook? Yearbooks are on sale with the Lady Under the Stairs for $65. You can buy the book with personalization online and make payments at Jostens.com by February 22nd at midnight. If you want to purchase personalization at school please stop by Ms. Kraft’s room 300 to get an invoice before purchase. Do you want a senior ad in the yearbook? Full page is $250. ½ page is $150, ¼ page is $80, 1/8 page is $45. You can create the ad online at Jostens.com. Ms. Kraft can create your page while you watch in room 300. It takes about 30 minutes to create the basics of an ad. Email tami.kraft@killeenisd.org or stop room 300 to set up an appointment to create your ad. Seniors – Senior pictures start Wednesday in your government and economics class. If you are going to be gone for a tournament or something make sure you go during your own time to get your picture taken. This is your last chance for a senior picture. Yearbook tux and drape pictures are free. All seniors can take a cap and gown picture for a $10 sitting fee. Coach Collins and Mr William’s former students take pictures on the 10th. On Tuesday, Jan. 15, we will have 2 class assemblies. During 2nd period, we will have a junior class meeting to talk about class rings and a fundraiser. All students will report to class first and then will be released to the auditorium by announcement. 3rd period we will have a senior class meeting to discuss caps and gowns. Again, students will report to class first, then will be released to the auditorium by announcement. If you attend class off campus during your assembly time, you cannot miss class. Just come by Student Activities when you are on campus to get the information you missed. If you have any questions, stop by Student Activities!